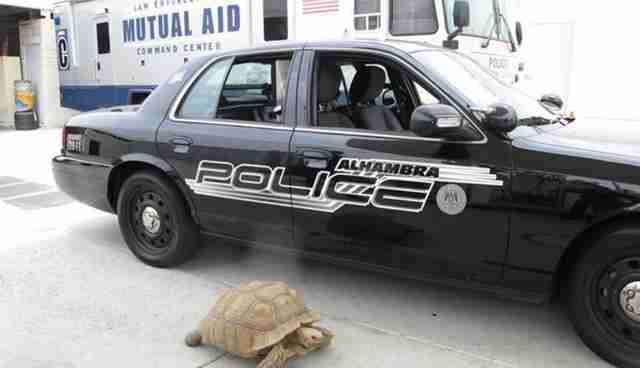 A tortoise recently led police officers on a not-so-high-speed chase through Alhambra, Calif., before the cops could wrangle the reptile to safety. 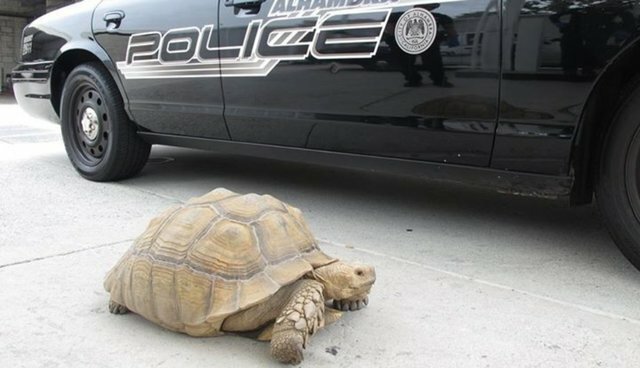 "It took two officers to take this guy into custody because it weighs about 150 pounds," the Alhambra Police Department wrote on its Facebook page. The tortoise, named Clark -- which did not respond to Michelangelo, Leonardo, Raphael or Donatello, the police department quipped -- was handed over to an animal care center, where he was picked up by his family. Gary Wilfong, of the California Turtle and Tortoise Club, told the Los Angeles Times that Clark -- based on his mugshots -- seems to be a healthy male sulcata tortoise, about 18 or 20 years old. At full tilt, sulcata tortoises like Clark max out at about 1 mile per hour, making this would-be renegade an easy capture. Although it's legal to keep tortoises as pets in California, owners need to apply for a permit to own desert tortoises that are native to the area. Sulcata tortoises, hailing from Africa, are exempt from this permitting process -- but they are not necessarily the ideal pets for every family. 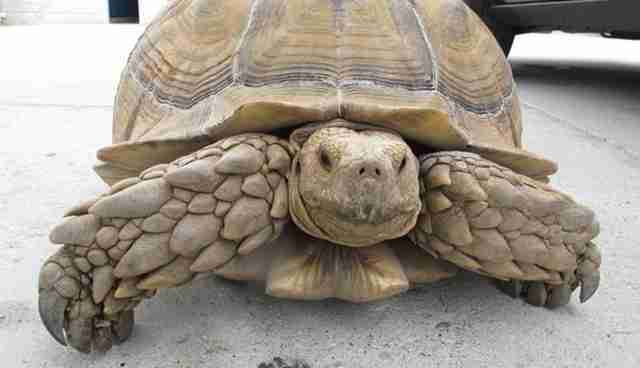 The American Tortoise Rescue cautions that sulcata tortoises can live up to 50 years and tip the scales at 200 pounds. There's a surplus of sulcatas in rescue centers, says American Tortoise Rescue co-founder Susan Tellem, the result of owners who don't know how to handle giant reptiles that "easily move furniture" and enjoy digging yards until lawns start to look like "minefields." If you have the space for a sulcata tortoise, don't go to a breeder, she urges, but adopt one from a rescue center.